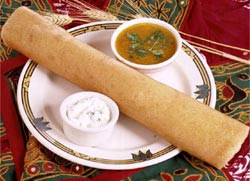 Tamil Hindu operators of Vaigai, a South Indian restaurant in Sunnyvale, CA, that serves the ever popular dosas, are facing charges of anti-Muslim bias brought by two Muslim cooks. In a lawsuit filed in late January in Santa Clara County Superior Court, Abdul Rahuman, 44, and Nowsath Malik Shaw, 39, both of San Jose, allege they were harassed for being Muslim by Vaigai's two owners, a manager and a top chef — a violation of the Fair Employment and Housing Act, according to a report in the San Jose Mercury News. According to the complaint, restaurant personnel regularly used ethnic slurs such as "Thulakkan," a pejorative term for Muslims in Sri Lankan Tamil dialect, to harass the two Muslim cooks. Also according to the complaint, restaurant staff were encouraged to call the plaintiffs by names such as "Rajan" or "Nagraj" under the pretext of not wanting to upset customers who might stop patronizing the restaurant if they heard the men referred to by their Muslim names. The complaint also states that the plaintiffs were forced to participate in a religious ceremony despite telling the owners it was against their Islamic beliefs. The complaint alleges that the restaurant owners insisted on their participation and proceeded to smear a powder on their foreheads, making the religious marking known as a "tilak." Named in the complaint as defendants are: co-owners Vijay Anand (who also goes by Vijayanand Krishnan) and Shridar Nataraj, Manager Sudakar Jothinathan, and Chef Balaguru, whose first name is never mentioned. "These incidents clearly violated the Muslim workers' rights and the treatment they received speaks of a level of intolerance that is deeply disturbing," said CAIR-SFBA Programs and Outreach Director Agnes Chong. "There is a need for communities to be respectful of similarities as well as differences of other faiths, and it is all the more important in the workplace." "27 year-old Yakoob Khan from Coimbatore, Tamil Nadu, was arrested at the age of 17, accused of being involved in the Coimbatore blasts in 1998, a charge that he vehemently denies. 'On the day of the blast I attended class at the Industrial Training Institute where I was enrolled, and when I was returning home I heard about the blasts'. In the wake of the blasts, the police went on a rampage, indiscriminately picking up Muslim youth. Some days later, Yakoob found himself in prison, where he was to spend almost the next ten years, much of it in solitary confinement in a small cage- like cell. 'I was accused of being in possession of explosive material, and of being associated with the Islamic group Al-Ummah, although I had never even heard its name.' In addition to routine torture, while in jail he was often abused for his religion. 'I would be beaten up if I wanted to say namaz. My torturers would tell me to face them while praying, rather than the Kaaba. They tore my Quran, and while beating me they would scream "Bharat Mata ki Jai"'. 'They ruined ten precious years of my life, my youth, falsely branding me as a terrorist', he says." "Yakoob Khan's friend, 34 year-old Shiv Kumar, alias Abdul Hamid, is a Hindu convert to Islam. He eked out as livelihood selling old newspapers and utensils for recycling. He was accused of being involved in the Coimbatore blasts, a charge that he denies. The police forced him to sign a blank piece of paper which they later filled out themselves, threatening him that if he refused to do so they would arrest his family as well. He was remanded to the Coimbatore jail on the basis of this forced 'confession' and his repeated applications for bails were rejected. Because he was the sole earner in his family, his wife was forced to beg in order to survive. He was finally acquitted only recently, after almost ten years in incarceration. 'I was mercilessly tortured in prison. I was constantly told that if I had not become a Muslim and had remained a Hindu I would not have been beaten like this', he says." The Mercury News quotes Mani Manivannan, former president of the Bay Area Tamil Manram, an association of 500 members who hail from Tamil Nadu as saying, "Tamil Nadu used to be one of the most secular states in the Indian union. They went out of their way to make sure people were treated the same. Muslims used to feel like full citizens." Unfortunately, Manivannan added, the growing rift between Hindus and Muslims in India, has now spilled outside the country. "That disease has spread to the U.S. as well," said Manivannan, a Hindu who had not heard about the case until called by the Mercury News. "Not a lot. But enough people get influenced by the news in India." Still, Manivannan said there are plenty of Hindus and Muslims who get along. He pointed how everyone he knows, no matter their background, is extremely proud of AR Rahman, a Muslim from Tamil Nadu who made history by becoming the first Indian to win two Oscars for his music in the movie, "Slumdog Millionaire". Haq - You should have stayed away from publicizing this isolated incidence. Trust me, South Indians are by far very tolerant and get well along with Muslims. Yes, there might be an increase in this type of incidents and you are only going to make it worst by giving it more press. It surely hurts but being a Muslim is a more accurate coordinate than a 6-coordinates accuracy needed for misguided UN-smart bombs. What the hell were bigoted Muslims doing in a vegetarian restaurant ..ha ha.Yes, in India, there are customs like breaking the coconut,chanting mantras,lighting lamps and pooja when doing something auspicious..etc.That goes for launching new submarines/warships,launch of TATA Nano(tatas are parsis..not hindus) and ALL bollywood film releases irrespective of individual religions. I can imagine the credibility of affidavit of jihadis..
Indians must come to grip with their own Hindu-talibans and other fascist Hindu organizations that are spreader of hate and prejudice. These incidents are not an isolated few here and there but have been on the increase. And while most Hindus like most Muslims and believers of other faiths do not practice extremism – the trend among many Tamil Hindu-extremists needs a closer scrutiny, not just the receding terrorists Tamil Tigers, but also their sources among the Tamil diaspora around the world. Or is it just an open season to publicize Muslim-extremists and not the extremists of other faith? A minister in India's Gujarat state, Mayaben Kodnani, accused over the anti-Muslim riots of 2002, has surrendered to police and resigned her posts. Ms Kodnani is alleged to have led a mob of rioters in Ahmedabad's Naroda Patiya area. She denies the charge. Nearly 60 Muslims were killed in this Muslim-dominated area with more than half of the 1,300 houses destroyed. After evading arrest for two years, Ms Kodnani had asked the Gujarat high court for bail but was refused. Mougamadou Bougary Saiboudine, who is in his late 20s, was a kitchen assistant at Vaigai Restaurant, which is being sued by Abdul Rahman, 44, and Nowsath Malikshaw, 39. They allege the restaurant's Hindu management harassed them for being Muslim. The cooks say Saiboudine witnessed the harassment. Saiboudine was fired on April 30, about a week before he was scheduled to give his deposition in the lawsuit, and given a ticket out of the country, according to a petition Saiboudine filed Tuesday in U.S. District Court in San Francisco. His deposition in the harassment case was scheduled for May 8. Saiboudine left for his native France on May 2. While changing planes in Canada, he was held by immigration officials and returned to the United States. He was deposed in the civil rights case in the Santa Clara County Jail on May 29, according to the petition. Saiboudine remains in jail and no hearing has been set on his immigration case. During the deposition, the petition states, Saiboudine testified that restaurant owner Vijay Anand asked him to "lie about what he witnessed at the restaurant" and now he feels his "life is in danger" because he has told the truth, according to the petition. Here's a true story of caste discrimination in India's Silicon Valley. A local si valley Pakistani-American friend and entrepreneur opened an office in Bangalore a few years ago and hired a woman as VP of engineering to run it. During one of his visits there, he and his wife took that woman to a fancy restaurant for lunch. Before seating them for buffet, the restaurant manager said he could not allow that woman to eat there. When my friend and his wife protested, the manager relented but he said he would not let that woman touch any of the serving spoons or other utensils. One of the staff would fill up her plate with food she wanted to eat. My friend and his wife left the restaurant in disgust. Later, when he sold the company, he gave a share of the proceeds to the woman but she had to take on a high/caste partner to buy a home in a nice neighborhood. She contributed all the funds and he got a share in equity for free.